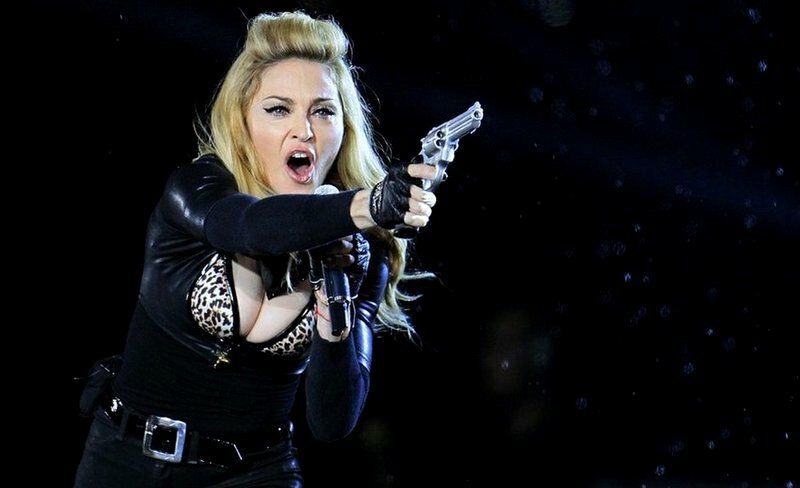 Madonna brought a fake gun on stage during a convert in Denver, Colorado this weekend just three months after Aurora, Colorado shooting. She had also started her show three hours late, and when it finally did start, it opened with a firing of fake shots. This isn’t the first time she’s offended people with her tour. She’s been using images of swastikas and these fake guns for more than several dates. Her explanation, according to an article at E! News, is as follows. I can see several different sides of this controversy. On one hand, I don’t blame concertgoers for being offended. The shooting is still fresh, especially to those so close to the location, and it’s most likely still a time of healing. I’m sure that hearing a bunch of guns go off, whether real or not, was not a pleasant experience. The performance also featured her dancers pretending to shoot each other, also something that is most likely offensive to concergoers. Here’s the other side. For one, you can still hear people screaming excitedly during her performance, so not everyone was offended. Also, this is Madonna we’re talking about. She’s kind of known as being offensive and crazy and risqué. She recently stripped down on stage with her young son in the audience. There have been reports about her tour routine for months now, so it shouldn’t have been a shock to people that fake guns would be used. Just playing devil’s advocate, because I happen to side with the offended on this one. I’m not one for censorship, and when I do support censorship it’s more of an exception to the rule. I just think that there could have been a little bit more done about this prior to the show. Not saying that she had to edit her routine or anything, but maybe she could have even made an announcement like, “Sorry so many people died. I don’t condone that”. Or maybe she just didn’t even realize where she was. When you’re Madonna things probably just fly by your head all the time. She sounded and looked great, and she is certainly not the first musician to use fake guns as props, so I don’t blame her for that at all. Actually, I don’t even blame Madonna. I blame her people for not being a bit more realistic. They could have even released a statement for her. Things like this can easily be avoided, just saying. ← Justin Timberlake and Jessica Biel marry in Italy, and I have the exclusive guest list info!